Today’s lesson is for my dear twitter follower, Deja! Actually she gave me many good ideas for the lessons. Thank you, Deja! If you have a request or a question, follow my Twitter (MaggieSensei) and tweet at me or just leave a message in any comment section here. I will make a lesson just for you — but only if I think it will help other people. Right now I have tons of requests and ideas lined up so it may take a time, though. ちゃう ( = chau) /じゃう ( = jau) mean “will finish” “will be done” and indicates a complete action. They are very casual and sound a bit childish or sometimes girly and cute. But many adults — even older adults — use them as well. Ex. I will finish my homework by tomorrow. =Ashita made ni shukudai wo shite shimaimasu. = Ashita made ni shukudai wo shichai masu. = Ashita made ni shukudai wo shichaotto! = Mou shukudai wo shite shimatta no desu ka? = Mou shukudai wo shichatta no? Can I finish eating this? =Kore tabete shimatte mo ii desuka? What!? Did you eat it already? = Eh!? Mou tabechatta no? = You didn’t eat this? = I will be in trouble. =Sonna koto wo yatte morattara komari masu. = I will be in trouble if you do such a thing. =Sonna koto wo yatte morattara komatte shimaimasu. =Sonna koto wo yatte morattara komacchai masu. =Sonna koto wo yatte morattara komacchau. = Sonna koto wo yatte morattara komacchaun desu. Did you do this, Maggie? = Kore Maggie ga yattano? = Kore Maggie ga yacchatta no? It often implies a bit of accusation like you did something wrong or made a big mistake. And now compare these sentences. = Shimatta ie ni wasurete kichatta! =Oh, shoot! I left it at home. = Nande anna koto icchattan darou. =Why did I say such a thing..
= Sonnani taberu to futocchauyo! = Don’t eat so much. You are going to get fat! = Mou watashi wo oittechatte iikara! =Now you can leave without me! = Hontou ni itadaichatte ii desu ka? =Are you sure it’s OK that I take this? = Maggie, kore tabechatte ii? =Maggie, can I eat (all of) this? = Aa koko ga kowarechatterun da. =Oh, this is the broken part! 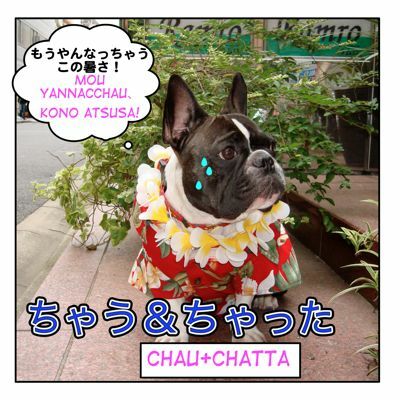 ちゃう ( = chau) and ちゃった ( = chatta) sounds a bit childish and girly so it has the effect of making you sound cuter or mischievous. = Mite! Kore kacchatta ♥! = I came to like you. =Now you caught me. / Now you know./ Was it obvious? = Jaa denwa bangou oshiechaou kana! =Then should I give you my phone number? = Are? Oshare shichatte dou shichatta wake? =Wow! You’re all dressed up. What’s the occasion? = Mou （ karerani) icchatteyo, icchatte! =Now just tell them, tell them! = Mou sorosoro natsu ga owacchau hazu na noni madamada kono atsusa wa tsuzuiteimasu. = The summer is supposed to be over soon but it is still hot. もう、体が参っちゃう！= Mou karada ga maicchau! =I am wrecked! Hi Maggie-sensei, good lesson, love it and thank you so much. i have a question. what function “chau” for this sentence? is it mean –it’s not read as “tokimeki gusa”, but “tokimeki sou”– ? So That ちゃう is Osaka/Kansai dialect. Hi Maggie! Lovely tutorials, you are the best! I have a question about one of the example sentences. But 持ってちゃって seemed incorrect. Please let me know your thoughts. Thank you so much! = Take it/them with you. 持っていってしまう　(持ってっちゃう）　involves the speaker’s feelings and しまう（ちゃう） means to finish something. In your example sentence 「しまった、家に忘れてきちゃった！ 」, what is the meaning of 忘れてくる? Also would it be correct to say 「○○を忘れてちゃった」 instead of 「○○を忘れてた」? The most natural way to say “Oops, “I left it home” is 家に忘れてきた・きちゃった because the speaker came to where he/she is from home and realized she/he left it home. 忘れる is just that moment when you left something home, 忘れてくる　means you left something somewhere and came to where you are. 家に忘れてた only works when you talk about the state in the past. So it is not natural in this case. Long time no see 😊😉 I was woundering if this 載れちゃすいそー is also a construction of 〜ちゃう?? But would is the いそー standing for? Would you mind helping me ?? = It could appear in the magazine. Oh 🤦‍♀️sorry I’ve forgotten something i wanted to ask you about this word 王道 I have seen it quite a lot and it seems to have lots of meanings which confuse me especially when it’s just used like a expression. Could you maybe try to explain it to me ? Verb-stem + Owaru and Verbてしまうbut I would like to know how to use it correctly and how is it difference ? I still can’t grasp the meaning of -te shimau completely because I can’t fully understand the difference of -te shimau when used compared to normal ones. Like for example, if I use -te shimau when asking for permission, what would the difference be when I use -te mo ii? Does sentences with -te shimau generally mean they’re negative? You mean the difference between てもいい？　and しまってもいい？ like these? 1) is simply asking for a permission for an action of eating. “Can I eat this?”. You say that before you eat something. Vてしまってもいいですか？ implies if you can finish doing something. “光栄いやっ” is iya~tsu the opposite form of chatta? im writing a comic and only know a little japanese ive been using google translate as practice so i dont know if everything is accurate. i want my character to express informally that they are flattered by a compliment. Is “光栄いやっ” a correct phrase? I wonder how you got いやっ on Google.. So you don’t say 光栄いやっ It just doesn’t make any sense. Sensei.. How about chau chau? Is there a difference between the usage of -chau and -chimau? ちゃう is a sort of cute suffix. ちまう is a rough male speech. What does しちゃいます mean in this sentence? That しちゃう is used when you can’t control yourself/ you can’t help doing something. I had a lesson with my Japanese teacher from italki on the 22nd of November. Today I had a Japanese friend check my notes to make sure my conjugations were correct and the example sentences I used for the different ways ちゃう/ちゃった were also correct. ・～でしまいます（じゃう） isn’t really used and can sound awkward and it’s sounds more natural to go with the original ます ending of the verb. ・～でしまいます(じゃう） includes a feeling of going against one’s own will. →It depends on the context. when you give an advice. = You shouldn’t do such a thing. = Sonna koto wo shicha ikemasen. Thank you 天人さん for answering jehdal’s question. Sorry jehdal! I didn’t notice your question until I saw 天人さん’s comment now. I’m always here for you and for those, who loves to learn Japanese. I check your site almost every day, learning something new; people have many questions and their questions (your answers) are a good source of information in order to improve my Japanese. Regretfully because of my work I don’t have much time, like before, to learn Japanese. But I try to make up 0,5 – 1 hour/day to spend my free time with my passion. Also, these forms “すごい＝すげー/すげぇ”　”やばい＝やべ” Can females use this type of verbs “やべ/すげー” or is it only for males? and please correct my spelling. 先生、is it possible to add a highlight feature in the comment section? I think it will be more easier to point out something.. I don’t think I can add a the highlight feature in the comment section. Sorry. You say とんでもない when you deny something strongly. = There is no way to swim in the ocean in winter. = Mom, can I go out tomorrow night? = Your Japanese is very good. “すごい＝すげー/すげぇ”　”やばい＝やべ” Can females use this type of verbs “やべ/すげー” or is it only for males? It is possible but men use it more. If a girl says すげー/すげぇ/やべー, their parents or adults around them are most likely reprove them. As for question 3, I mean in this sentence “みんな　真剣な顔して　きばっちゃって” what exactly is “ちゃって” and why is it at the end? Is it a complete sentence? 1. As for “ちゃう” form, can you please tell me which age group can use it? Ah.. OK, we finish a sentence with ちゃって on purpose in the following cases. (1) When you point out something. (2) When you explain some reason. (3) When you describe something. Q1) I would say younger people tend to use more than older people. But older people also use it. Ex. ご迷惑かけちゃってごめんなさい。= I am sorry that I trouble you. When someone complains a lot or talks back to you, you can say both うるさい・だまれ or even both. However, I know that when talking to yourself, you would use “おう/よう or it depends on the word” at the end. For example, “何をつくろうかな/どうしよう”, but in the case of “宿題をしちゃおっと” is the ending “っと” used to express talking to oneself? and please give me another example for this. 1. “だまってもらっちゃおうか？” You want to just take it without asking? if “黙る” means “to be silent, what exactly is the word for “shut up”? Because usually they would translate this verb as “shut up” I’m confused. Can you please explain it more and give more examples? 3. How to use “ちゃって” as a connector between sentences. I heard people use it at the end of the sentence and then start a new one ending with “ちゃって” what is this grammar point? is it a connector? 4. 先生、 you mentioned that when men use “ちゃう” form a lot, they would be called “shallow”. Does that mean that men cannot use them? is it only for females to sound cute? 〜っと ending is a very causal way to express your will. It doesn’t matter if other people are listening or not. It is often use when you decide what to do right before you say that. 何をつくろうかなあ→そうだ、今日は天ぷらをつくろう！ I am going to cook Tenpura today.→(casual)今日は天ぷらをつくろっと! Oh maybe I should make a Tenpura today. Compare to つくろう、つくろっと gives an impression that you just got the idea what to cook. So when you compare 宿題をやろう・やってしまおう：やっちょう (A) and 宿題をやろうっと・やってしまおっと・（やっちゃおっと）(B), while A shows your will that you are going to do homework in general, you use B, when you were doing/talking about something else and you just remembered you have to do your homework. Oh, I guess I have to finish my homework. “V+てもらおうか/V+てもらいましょうか/V+てもらっちゃおう” are sort of command form. It shows the listener owes the speaker to do something. It may sound polite but it sounds very demanding. = Kotae ga miechatte irunndesukedo. = I am stressed up. 3. I don’t understand your question well. I can’t think of any example.. Sorry. 4. No. men can use it but overusing ちゃう sounds shallow. That’s all. I hope you are fine and everything is well. Thank you always for supporting us and helping us to learn this wonderful language. How to use “ちゃう” form here? 3. “そんなことをやってもらったら困ります。” what is the meaning of “やってもらったら” here? 4. “忘れてきちゃった” what is “きちゃった”? 宿題をしてしまおっと = I guess I will finish my homework. 宿題をしようかな = I guess I am going to do my homework. Use 〜（し）てしまう(to have done something / to finish doing something) form. 宿題をしてしまおうかな = I guess I will have my homework done. You may not learn this in your textbook but we say this often in casual conversation. Ex. I guess I will go to sleep now. Ex. I guess I am going to eat this. 3) We usually use V+てもらう when you receive some favorable action from others. But we sometimes use V+てもらう for negative situations. OK, I guess that’s all. Hi! Can you explain the -chattari form please? I’ve heard it in a form but cannot understand it. Great lesson! I do have one question, and I apologize in advance if it was discussed in the article. Can you make chatta or chau negative, and if so how do you form it? Thanks in advance! To fully understand ～てしまう I advise you to read the whole lesson. It is a light way to suggest marriage. Are there any difference between じゃない and ではありません in terms of meaning and usage? If there is, how do we use them, say, for the above example? ２．How should we address someone? For example, 渡辺リオ. Do we address her as 渡辺さん or リオさん if we first met each other? I added the formation part for you. Please check. Thank you so much for your consideration. It is the part when you add the small tsu that confuses me. I am having problem as to which verb to add small tsu or vice versa. OK, if you have a problem with って then you might want to review how to make て-form as well. You can always check the verb lists but there is a way to remember the basic ones with a song. Go google the te-song. You will figure out when you use っ, ん,い and exception in a fun way. Here is the lyrics. It will be easier to remember with songs. There are a lot of videos on Youtube. Can you tell me what kind of construction is -てもらっちゃ and it’s translation? The sentence is 忘れてもらっちゃ　困るよ！ The context is a bullied person that forgot her past and meets with the man that bullied her. He attacks her and when she remembered him this was what he replied, the next sentence is that her father arruined his life. I would like to know if the full sentence is 忘れてもらては　or if it’s a construction with　しまう or if it’s another shortening. Thank you in advance and sorry if here is not the place to ask about it. BTW, do you have now a Maggie room? Hello Ana! Sorry, currently Maggie’s Room is down but will put it back eventually. Meanwhile, feel free to leave a comment or question any comment section or contact me on Facebook or Twitter. But when we use the verb like 困る, we use もらっては to add a feeling of sarcasm and emphasize what action cause the problem. “If you forget about it, I will be in trouble” → Don’t forget about it! = Konna tokoro ni nimotsu wo oite moraccha komaru. = Sukina you ni yatte moratte mo komarimasu. Thank you so much! I couldnt understand why he used the verb morau in this situation but now I understand. Does the small っ in 「もう、私を置いてっちゃっていいから！」 come from いく, or is it a mistake? Thank you for your time, I really like the site! So the verbs were 持っていく and 置いていく. Then shouldn’t it be 「これ持ってっちゃって！」? As the difference is very subtle when spoken, can one assume that …て(っ)ちゃって is usually from …いく+しまって, in other words, is …ている+しまって ever used? *置いて（しまって）→置いちゃって = Put it here. I have a doubt with the meaning of 「そんなことをやってもらったら困ります」. Does it mean “You’ll get in trouble if you do something like that (for me)”? Thank you very much for this lesson, Sensei! Hi Orti! Thank you for spotting the mistake and sorry I didn’t put the translation there. I will be in trouble if you do that. would it be a different structure if you wanted to say “you will be in trouble if you do that”? or is it “I will be in trouble…..” just because the subject isn’t mentioned? I know Japanese is sometimes confusing because we often skip the subject and unlike Spanish, we can’t always tell the subject by the conjugation of the verbs. But in this case, やってもらう is a key word here. Someone does something for/to me. And it is not natural to use 困っちゃう if the subject is you unless you add でしょ (aren’t you, won’t you) etc. You will be in trouble if I do that, won’t you? I will be in trouble if you (or someone) do(does) that. but i have a quick question about しちゃう. (maybe its a bit silly question ><") at the part "express your emotions", do you use it just with bad things?? like you wrote, when you miss the bus, or you are in trouble, or did something wrong. is it emphasize the emotions just about bad things? Thank you for your nice comment! I am glad to hear my site helps you. Oh, it is a good question. No, しちゃう can be used for neutral or positive things as well. I separated “expressing one’s emotions” and “To finish doing something, to complete some action” but you can express your emotion when someone complete an action. もう宿題終わっちゃったの？ You are impressed that someone has finished the homework. It’s clear now! you helped me a lot! Thanks so much for this lesson. My Japanese grammar book teaches all kinds of lofty ideas about elevated usage and so on, but doesn’t really go into this kind of colloquial Japanese. It’s nice to be able to watch anime, drama and so on and think ‘ah, I just learned that!’. こちらこそ！Thank you for your comment! What you learn from grammar books and teachers are essential. But if you don’t know colloquial Japanese, you won’t be able to understand the real conversation because we don’t always talk like a text book. I have been told that for verbs like 飲む、読む、遊ぶ etc, when using the casual version of ~てしまいました／しまった they turn into ~じゃった. Is this correct? Yes, since I wanted to concentrate just ちゃう and ちゃった, I didn’t write about じゃった but maybe I should add the information. I did go on to ask, if it's じゃった for the past-form, then does that mean it is じゃう for the present form? I'll finish reading it by tomorrow! じゃうpart is correct. And yes, you can use it for the future. Just 明日”に” is strange. Either 明日(without particle) or 明日までに is better. Howdy! Love the site! I have a quick question! Can you use ちゃう in the emotional sense to express regret for things that are uncontrollable? Hi Maggie-sensei, I have a question. Are these valid Japanese expressions? もうラブラブになっちゃって、means They got lovey dovey. But other words are just play of words so I don’t know if you can learn Japanese from it. But you can see lots of ちゃって from it huh? Haha, Maggie-sensei, you got it right. It’s the chorus from Ura-Omote Errors. I was trying to clear things up for myself because of all the different contradicting translations and explanations of the lyrics. I always wondered why the composer wrote a lot of ちゃって in there. At least “toushindai no ura-omote” was the only thing I could understand. Did I say Errors? Sorry, I meant Ura-Omote Lovers. I guess having lots of chatte in the lyrics gives more upbeat feelings. But aren’t they use for time when its like you did something and regret something. Or something like It’s not exactly good thing to do. Isn’t it? Yes, it is. As I wrote in the lesson, “ちゃった” expresses the feeling of regret for the things you have done. Sorry, I have two questions. That means something like: “Well, if I might say so…”. What kind of use is that one? 2) Are 言っちゃった　and ばれちゃった always girly? Oooooops, I kind of used them often. I’m on vacation now so I will answer your questions as soon as I come back to Japan! Sorry that it took me a long time to answer your question. Now I am back and able to answer your question with time. Don’t worry too much. Many guys use it and it is natural. But don’t overused it. チャラ男 = charao (slang for a shallow guy) has image to use this too much so.. It also depends on how you deliver it,too. ^^Thank you much, sensei. I always forget this word when it comes up. No problem. Ask me again if you forget it! BTW what is your favorite manga? What does バレ really mean, sensei? I see a lot in manga. ばれたか! = Now you know (the secret). You caught me. I’ve seen it before in Manga…no wonder I have trouble understanding Manga. Oh…and one more question, please? Your example …しちゃおっと。 Why is it おっと? ~（し）ちゃおっと！ is another casual expression to show your intention to finish doing something. First, have you ever heard these expressions? Ex. 食べる→食べよっと I am gonna eat! Ex. 寝る→寝よっと I am gonna sleep! Ex. 勉強する→勉強しよっと! I am gonna study! →これ食べちゃおっと! I am going to finish eating this. →もう寝ちゃおっと! I am going to sleep now. →勉強しちゃおっと！ I am going to have finished studying! It requires your will to do something or finish something so your previous phrase 疲れちゃう won’t work here. X 疲れちゃおっと I am willing to get tired. Yes!! you can say “疲れちゃった” ! !